Last month was so busy that time just got away from us before we could out together an entry for the Royal Foodie Joust sponsored by Jenn the Leftover Queen. When this month's ingredients, whole grains, ginger & citrus, were announced we were a little stumped at first. I figured I could do a salad using wheat berries or something of the sort but it wasn't really exciting me. Then it was brought to our attention that wild rice is a whole grain, ideas just started coming & this dish was born. I decided to do cherry glaze for three reasons. First because the flavor of cherries just seems to partner perfectly with the nutty goodness that is wild rice. The second reasons is that I've been wanting to find more recipes to use the dried sour Michigan cherries Matt's parents brought us. Finally, I think the sweetness of the cherries works well with Asian flavorings that I was planning on using. The sauce actually started out as just Asian Cherry but as I was making it & tasting it I felt like the sweetness needed a foil. The hot Chinese mustard gave it a little bite but it needed more. I added Sriracha to give it just enough heat to warm the back of the throat & suddenly the sauce was Sweet & Spicy Cherry. The glaze ended up being such a fantastic blend of flavors that it has us licking our fingers as we tried to get to every last piece of meat. Mix everything together in a large bowl. Add game hens, completely submerging (I put a plate on top to help hold the birds down. Let brine for 6 - 8 hours. Heat the grill to 350 F.
Bring 2 cups of water to a boil in a medium saucepan with a lid. Add the wild rice, cover & turn down the heat. Allow to simmer for 40 - 50 minutes until the rice is tender but still has a bite. If there is extra water left once the rice is cooked either drain it or allow it to boil out with the lid off. While the rice is cooking, heat the olive oil over medium heat in a small saucepan. Add the garlic & ginger and cook until softened & fragrant. Turn the heat down to medium-low & add cherry preserves, soy sauce, vinegar, mustard, lemon juice, Sriracha & honey. Stir & let simmer for about 5 minutes, it will thicken slightly. Divide the sauce in half leaving one half in the saucepan. Butterfly the Cornish Game Hens by removing the backbone. 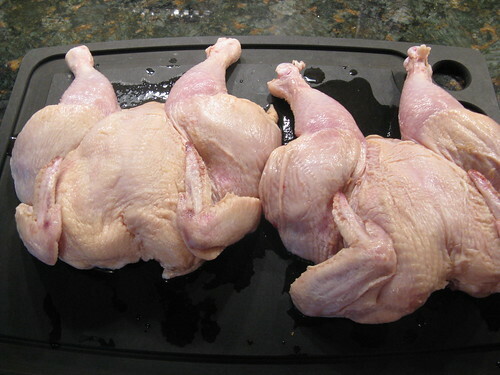 Oil the grate of the grill & place the hens over direct heat breast side up. Cook with the cover closed for ten minutes. 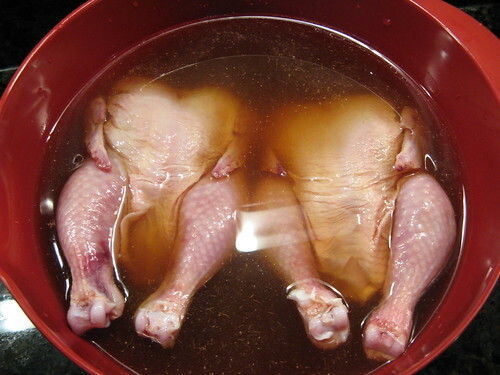 Brush the hens with the 1/2 of the glaze not in the saucepan. Close cover & continue to cook for another 10 - 20 minutes until the hens are fully cooked. Remove from the grill & allow to rest for 5 minutes. While the hens are resting, add the dried cherries to the remaining glaze in the saucepan. Turn the heat to medium-low & allow to simmer for about 3 minutes. Serve the hens over the wild rice, drizzling both with the remaining glaze. 1. I recommend using 100% wild rice not a wild rice blend, both the texture & taste are better. It can be pricey but its so worth it! 2. The glaze would also be good just on a few chicken breast or with pork. 3. We did this on the grill but it could easily be done roasted in the oven as well. 4. Sriracha is an Asian pepper & garlic hot sauce, you can substitute whatever hot sauce you like. 5. We each ate a whole hen but really we could have spilt one hen in half & had enough. Ben & Carmen - Maybe it was the brining or the game hens we bought but these didn't taste gamey at all. Really they tasted just like a chicken. 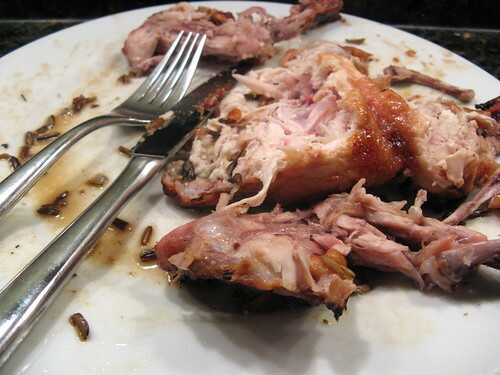 I've only had cornish game hens once, and we really liked them. What a great recipe! That looks fabulous--great entry! Good luck in the Joust! Wow, looks fabulous! Good luck! A lot of work but it really looks so well worth it. I love a good cherry glaze--yours is perfecto! 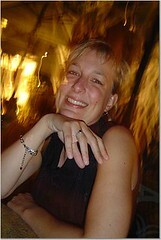 Thank you for your post at my blog. I think Cornish game hens tastes about the same as chicken. But wow in your case who cares about the chicken. That glaze is amazing! I like to brine my turkey at Thanksgiving. It makes such a big difference. I am a big fan of brining any meat! It makes it soooo juicy and flavorful! And yes the Lowel Ego loght is awesome! Looks great! I love the combo of cherries and wild rice. I love love love love cornish hens. I have to make the cherry glaze. If I don't use cherries, I'll find some other suitable fruit. I usually do an apricot glaze on my hens, with couscous. I make them every year for Christmas or Thanksgiving. 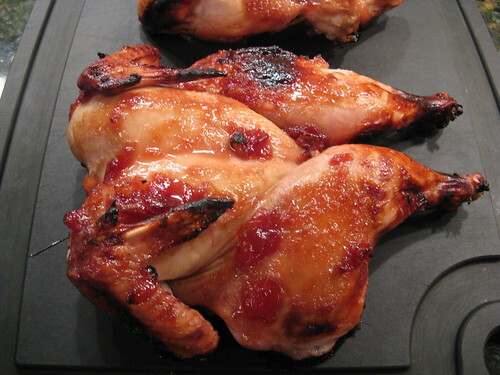 That looks fantastic, I love the idea of the cherry glaze! The brine and glaze could definitely be useful in my kitchen. Thanks for the recipes! I think we have a winner! I like the idea of using a brine. I'll have to give it a try. That sounds delicious! 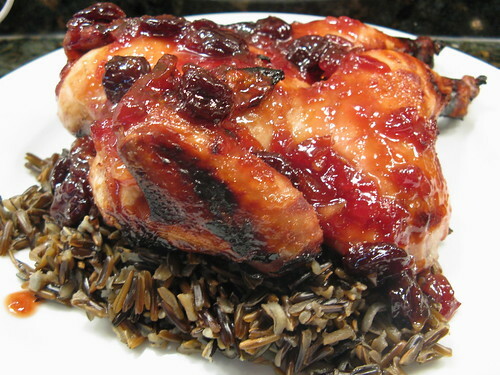 I love cherries and wild rice - and I think cornish game hens are such a cool thing to serve for a dinner party! Great Joust entry! This is a fabulously delicious entry! I would love to eat some right now! Best of luck! :) Looks like a great contender! This is such an amazing entry - I absolutely love the idea of the sour cherries with spice! If it's on a stick...eat it!